Full proces control without methane slip. Low Total Cost of Ownership. Pentair Haffmans has supplied a biogas upgrading installation to the Hoogheemraadschap Hollands Noorderkwartier (HHNK) wastewater treatment plant in Beverwijk, the Netherlands. Here, biogasgenerated from sludge is upgraded to biomethane and carbon dioxide (CO2), thus producing two valuable products. In the wastewater treatment process water and sludge are separated. Biogas can be produced from the sludge that remains after the separation. In Beverwijk more than 2 million cubic meters of biogas are generated per year in three fermenters. HHNK selected Pentair Haffmans’ biogas upgrading system to replace the already existing small-scale one. Pentair Haffmans designed a compact solution, housed in two pre-assembled 40-foot containers that were placed at HHNK near the biogas fermenters. HHNK and Pentair Haffmans calculated that after start-up more than 1.28 million cubic meters of biomethane per year can be produced at Beverwijk. This is enough to supply 700 households with their annual consumption. Because the biomethane has the same specifications as natural gas it can be fed into the national gas grid. The Dutch company Biogast provided its Bio2Net feed-in station to connect the system to the grid and guided the project through all procedures and permits. 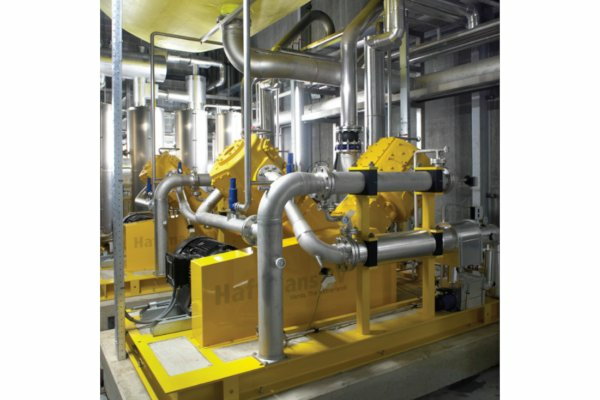 Pentair Haffmans’ state-of-the-art biogas upgrading technology offers two benefits, which are unique in the industry. The technique used by Pentair Haffmans makes it possible to recover 100 percent of the methane, so the environmentally harmful ‘methane slip’ that usually occurs when other upgrading techniques are used, is completely eliminated. Besides ecological benefits, this also means that more biomethane can be fed into the grid. 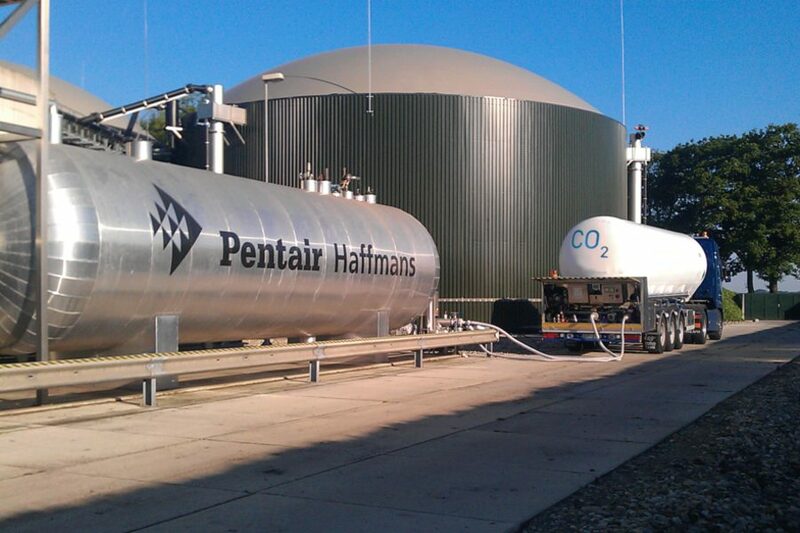 In addition, Pentair Haffmans’ biogas upgrading installation allows the customer to recover the CO2 by-product. In Beverwijk, a part of the recovered CO2 is used to adjust the ph value during the wastewater treatment process. The recovered CO2 can also be sold for use in greenhouses or in food and beverage applications. Not all of the biomethane produced at Beverwijk is fed into the grid. Part of it is used to fuel HHNK’s car pool. The company placed a filling station on its premises, next to the upgrading system. Here, the biomethane is pressurized so that it can be used to fill the cars’ tanks, thus providing a cost-effective alternative to ordinary fuel. Currently, HHNK has 19 biomethane-fueled cars. According to Duineveld, HHNK plans to add more than 50 biomethane-fueled cars in the coming years. At that point, seven percent of the biomethane produced at Beverwijk will be used to fuel cars. Meanwhile, other water authorities in the Netherlands have shown interest in running their cars with the biomethane from Beverwijk. The Beverwijk installation is a promising example for a flexible, sustainable and efficient use of multiple types of resources. “This project will gain a lot of attention as it shows the great potential of sustainable energies and a variety of options of how to deploy them in the best possible ways,” Duineveld concluded.